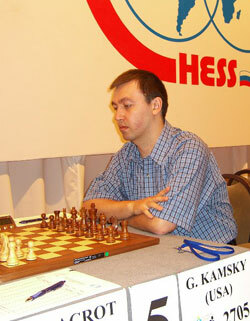 The United States Chess Federation - Kamsky Advances in Elista! Home Page Chess Life Online 2007 May Kamsky Advances in Elista! Gata Kamsky won his third game in a row against Etienne Bacrot at the Candidates Matches in Elista. He now advances to the second round, where from June 6-14 he will play the winner of Rustam Kasimdzhanov-Boris Gelfand. That match is still tied at 2-2. The only other player to win his match so quickly was Peter Leko, who scored 3.5/5 against Mikhail Gurevich.